George Thornton was born on 23 December 1819 in Macquarie Street, Sydney, the son of publican Samuel Thornton and his convict wife Sarah, nee Madden. On 4 August 1840, he married Mary Ann (d.1913, aged 91), the daughter of John Solomon. Predeceased by a son and daughter, George Thornton died on 23 November 1901 at his residence, Lang Syne, in Sorrell Street, Parramatta, survived by his daughter Frances. He was buried at the Church of England Cemetery at Rookwood. George Thornton’s mother Sarah was transported to Sydney for larceny, being sentenced at the Old Bailey on 3 November 1813. She arrived on the Broxbornebury on 27 July 1814 and her future husband arrived as a free settler in the Somersetshire on 17 October 1814. Their son George Thornton was educated at WT Cape’s academy and the Reverend JD Lang’s Australian College. He joined the Customs Department in 1836, as a storeman and later clerk, and in 1840 set up his own business as a customs agent. His estate was sequestered from February to August 1844. By 1850 George Thornton was in partnership with Walter Church as Customs House agents and shipbrokers. He was a partner in the importing firm Tucker & Co., 1859–63 and 1869. He owned the schooner Tom Tough. He also had an interest in the Duncan Dunbar which was wrecked off Pernambuco in Brazil on 7 October 1865. Thornton and his family survived the wreck and he was presented with an address of gratitude by passengers for his gallant assistance before their rescue. A fellow survivor was future Alderman Frederick Penny. Thornton lived at Longwood, Darling Point, for some time before moving to Parramatta. Thornton was a founding Director and Chairman of the City Bank of Sydney 1885-88, a Trustee of the Savings Bank of New South Wales, and Chairman of the Mutual Insurance Society of Victoria. Between 1873 and 1886, he was the NSW commissioner for five international exhibitions and a member of the Royal Commission into Fisheries. He was the founding councillor of the New South Wales Aborigines Protection Association in 1880 and was later appointed Protector of the Aborigines. In 1883, he became the first Chairman of the Aborigines Protection Board and in 1892, co-authored with Richard Hill, he published Notes on the Aborigines of New South Wales. 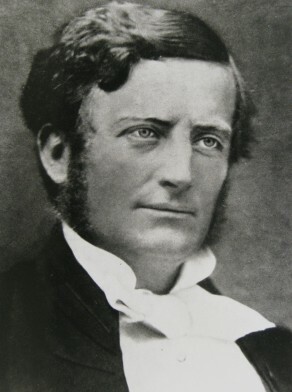 George Thornton was a member of the Legislative Assembly for Sydney, 15 January 1858 to 11 April 1859. He was elected to the Legislative Assembly representing Goldfields West on 26 February 1867 but resigned his seat on 31 December 1868 to revisit England where he administered the Agent-General’s Office for a year. He was appointed to the Legislative Council in 1861 but did not take his seat and was re-appointed from 1877 to 1885. He was the Secretary for Mines in 1885. Thorntonwas Alderman for Cook Ward, 1 November 1847 until 31 December 1853 when the Council was replaced by a three-member Commission. He was re-elected Alderman for Fitzroy Ward on 11 April 1857 and served the Council until 1858. He was Mayor in 1857, commemorated by an obelisk concealing a sewer vent (known as Thornton’s ‘scent bottle’ or ‘stink pot’) facing Bathurst Street from Hyde Park. While Mayor, he composed The Cornstalk Polka, possibly for some civic occasion, published by J R Clarke. He was also Alderman of the Woollahra Municipal Council in 1860 and was elected first Chairman of the Borough on 6 June 1860. Martha Rutledge, ‘Thornton, George (1819–1901)’, Australian Dictionary of Biography, National Centre of Biography, Australian National University, http://adb.anu.edu.au/biography/thornton-george-4720/text7827, accessed 26 November 2012.